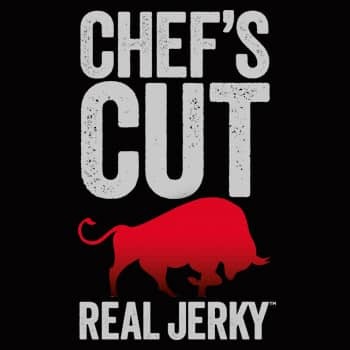 Chef’s Cut Real Jerky was created by Chef Blair Swiler and former PGA player, turned professional caddy, Dennis Riedel. Blair has been smoking meats his entire life; a tradition passed along from his father. In 2009, becoming tired of having to buy terrible jerky every time they played a round of 18, golf buddies, Blair and Dennis, teamed up and began smoking and selling Chef’s Cut to golf and country clubs across the US (turns out jerky is the perfect golf bag accessory). Today the vision to change the jerky world has resulted in the best tasting, highest quality jerky on the market. The secret? We stay true to Chef Blair’s relentless attention to quality and flavor. We use only premium cuts of steak and white breast meat – unlike the tough, chewy pieces of “mystery meat” our competitors use. We always hand-cut each piece, using only the finest real ingredients – just like you would find at your favorite steak house. The result? A healthy, high in protein, low in fat and great-tasting, making Chef’s Cut the perfect alternative to the standard high-fat, high-calorie snacking fare. And while we have grown to reach people beyond the golf course, our goal is still the same – change the way people think about jerky – one healthy snack at a time. Chef’s Cut Real Jerky is the jerky you’ve always wanted. It’s Jerky Done Right. Dig In.